Wow. Tempering. It’s been a bit like learning to drive standard. At first, it seems far too complicated, but through trial and many errors, false starts and stalls, shouting and injuries (well, one injury) I think I understand it. And I think I’ve found “my” method – seeding. See, it just makes sense to me. 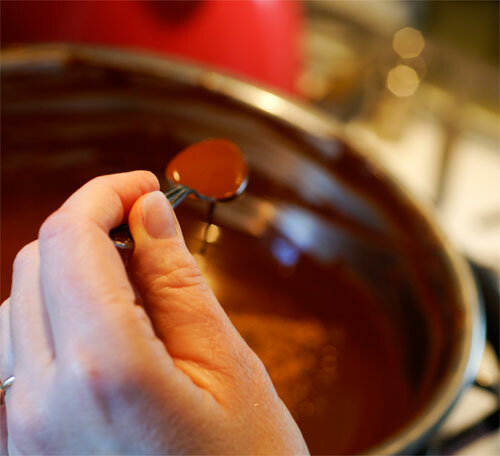 Perhaps it is because of my desire to control things, but adding small shavings of tempered chocolate to the melted mass of chocolate you are trying to temper is far easier than trying to control a rapidly cooling pool of liquid chocolate, while stirring it on a marble slab. It’s just because my tabliering technique is awful – but I found seeding much easier. When I went to set up the kitchen this time, I felt much more confident and was soon at the cutting board, breaking up the chocolate I had tempered the last time. I was thrilled when the shiny pieces snapped in my hand, and I was able to get ¾ of a kilo broken up in no time. So much easier than chipping big hunks, and my pinkies were safe. 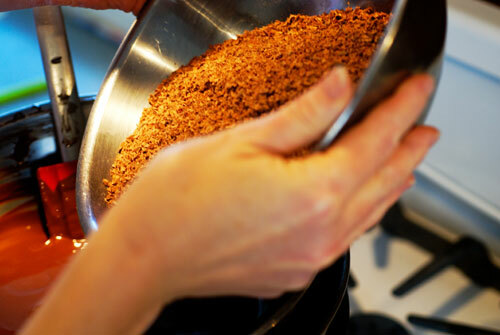 Then, I got the ¼ kilo of “untouched” (at least by me) chocolate and grated it into another bowl – my seed chocolate. This time, I also read and re-read the lesson, not only for the steps, but for the sense of why I was doing them. I also made notes on paper for myself, to have at each work station in the kitchen, with arrows and exclamation marks pointing to all the critical timing steps. Over to the stove, and my rigged-up bain-marie, and before I knew it, had a bowl of the fragrant, liquid brown stuff. This seemed to take much less time than the first attempt at tempering. 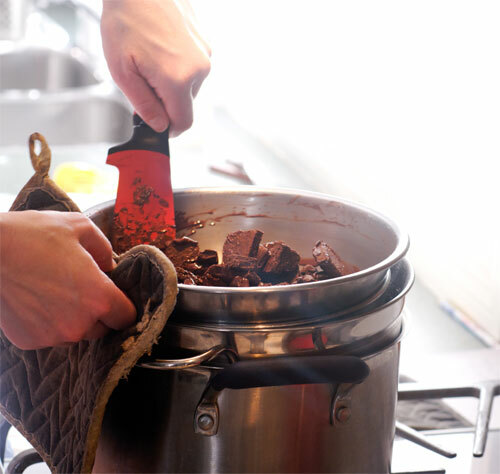 I guess, because the chocolate was in smaller pieces, or perhaps I was less fearful of burning the chocolate, but I kept stirring, and humming, and perhaps managed to maintain a more even temperature. I found having a digital thermometer really helped take the guess work out of whether I had the chocolate in the correct range. Now, I absolutely love chocolate, and the smell of this, as it was melting, was heavenly, but the funny thing is, in both this exercise and the previous one, I had absolutely no desire to eat any of it. I can’t figure out whether this was because of some desire to save my precious materials, in case I messed everything up and had to throw the whole batch away, or perhaps my stomach was so clenched in nerves, I couldn’t have eaten it, anyway! But this does bring me to another observation about working with chocolate. While it has many enemies, it is awfully forgiving (character traits I wish to strive for). If you mess it up, you just re-melt it. If you mess up when you are baking , say, adding the wrong ingredient, or forgetting to separate the eggs and adding them to you cake batter whole – you fail – you get a nasty tasting product – no forgiveness, there. Back to the chocolate: now at 104.5 degrees F, did a quick blob test of the not-yet-tempered chocolate, on a piece of parchment paper, and I’m ready for seeding. Hmm. This part takes longer than I expected. I needed to get the chocolate to 88-90 degrees F, and assumed that would happen as soon as I began adding in the grated chocolate. Not so. It actually took about 15 minutes, and I had to keep checking with the thermometer (the temperature gauge seemed to jump around quite a bit), then scraping it off, so the hardened chocolate on it wouldn’t throw off the accuracy when it got dunked back in the mass. Note to self: maybe I should have invested in the really good, accurate thermometer, instead of the ten dollar one. Finally got the temperature in the correct range, did my temper test (chocolate blob on parchment), got a bit impatient (perhaps should have done a temper test on myself), and started adding in the shaved seeding chocolate, a bit too rapidly. No, if truth be told, I dumped in a good half of the remaining chocolate. Had to get the temperature back up a bit, back and forth, on the heat, off the heat, curse myself, dry the bowl, test the temperature, set the timer, stir, and stir and add shaved chocolate little by little (I have learned my lesson), pray for twenty minutes to be up. There goes the timer. Well, the temperature is definitely a little low at the twenty minute mark (87 degrees), but I gleefully pour my finished product onto the parchment covered marble slabs to solidify, and sink into a chair. I am going to tell everyone it is intentional, and can only be achieved with an artistic hand. Perhaps it will become my speciality. Or perhaps I will practice. Hmm. Now, I am craving a piece of really good chocolate.